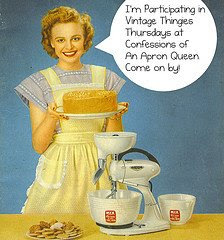 Once again, I am participating in Confession of An Apron Queen's Vintage Thingie Thursday! I have had this ashtray for over thirty years. My neighbor gave it to me, because she didn't like old things. Her mother-in-law had given it to her, and told her it was not only old but it was very old. But because she didn't like her mother-in-law, or have a love for old things, she gave it to me. For years, I used it as an ashtray until I moved to a new neighborhood right next door to a whacky lady from Belgium. I grew to love her to death, but she was very loud and nosey. She saw me using this ashtray and jumped up and grabbed it off the table. She looked at the bottom, and told me it was an original hand painted Delft. I took it to a couple of antique dealers who concurred with my neighbor. According to the antique dealer, it was made between the 16th and 18th century. 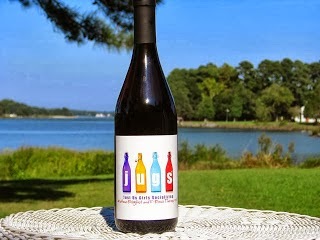 Besides the brand name, it also is numbered and bears the initials and location of the artist. Of course I quit using it as an ashtray, but I do have it out on display. I have another ashtray that I bought after I quit smoking. I don't think it's vintage, but I love it! It's also hand painted and signed by a Parisian artist with my sir name. 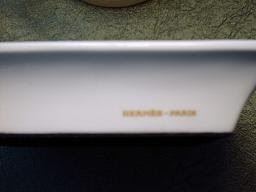 It says Hermes - Paris on one side, and Made in France on the other and numbered 320. Santa, you do see why I need a new camera, right? I bought it new for about one fifth the original price. The details and colors on the horses are beautiful. 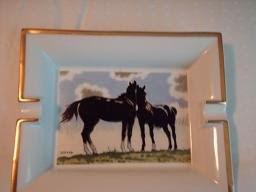 It's a large ashtray, about 6x9 and reminds me of the wild mustangs on Pioneer Woman's ranch. Little One busts with delight when she sees horses, squeeling, "PONEEEEES!! PONEEEEEES!!" Ill have to show her those ash trays. BTW, the painter, may in fact be related to our Out Law Relative, right? glad to NOT have them anymore and glad to hear that you kicked that habit too. Made between the 16th and 18th centuries? That may be the only thing older than the mold in my refrigerator. It looks like you and I will be going to dinner over at Foolery's on Tuesday night. See you then. Things like that get broken around here. This is why we have plastic or the ground works too until I have to rake it. ooooo! 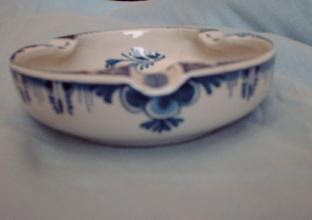 I don't collect ashtrays, but I do collect Delft. That is a wonderful piece! I need to start collecting something. Your vintage things are very beautiful! I am glad your ex neighbor didn't like her mother in law : ). You lucked out! I avoid collecting things at all costs. My mom always tries to buy me Easter and Halloween and Christmas decorations and I'm like NO!!! Whoa! what a discovery. Those are beautiful ashtrays. 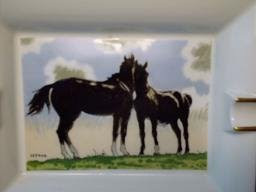 I'm glad you got that great information on the delft one..
Hey HSH, I found another Hermes ashtray by the same artist with horses for Little One on Ebay. Check it out and maybe get it for her for Christmas. She can use it to hold her hair clips and barretts. Oh, and if she doesn't like it, I will take it off your hands. Just beautiful! Thank goodness for nosey neighbors!! I had some wonderful antique pieces that I proudly displayed. Once I discovered their value, I put them away :( It sort of ruined it for me. Of course, I have nothing as impressive as your Delft! 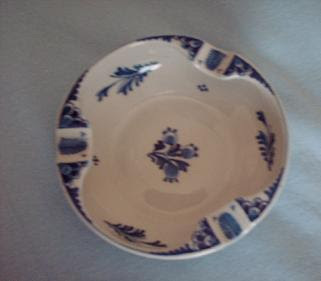 I adore blue and white china, especially Delft, so I love the ex-ashtray! Great story about the ashtray. I love old ashtrays and the two you shared today are great. Sometimes nosey neighbors aren't so bad after all, are they? Don't you just love it when someone who "hates" old things gives you something that is so great!! I like both of them, the ponies are exceptional. Great post. ohhh Grandma..Ilove me those old ashtrays!!!!! Love, love, love that Delft ashtray! I'd use it for a candy dish! Those ashtrays are sooooooooo beautiful, my dear, but not has beautiful as you! Oh my gosh I bet you about had a heart attack when you found out you'd been using a genuine antique for an everyday ashtray!